:Resting your heart and mine, and giving your thoughts over to Christ can be difficult to do in the midst of lifeâ€™s everyday busyness. When you give a loved one the Be Still And Know Bangle Bracelet, youâ€™re encouraging your wife, mother-in-law or aunt to take some time out of their day and spend it with the Lord. 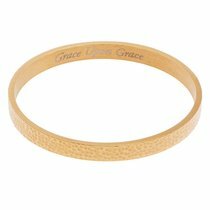 Each time she reaches to put on the Psalm 46:10 Bangle Bracelet or remove the Christian bracelet from her wrist, sheâ€™ll remember to make time in her day for Him. About "Bracelet: Be Still & Know Bangle, 316 Stainless Steel With 14K Gold Plating"